The last club night will be on Wednesday 21st December 2011 and we will return to training on Wednesday 04th January 2012. We’d like to wish you a very happy Christmas and look forward to seeing you in 2012. Thanks for your support over 2011! From the 16th November 2011 we will be reverting to our original opening times. This is because Sensei Carl has work commitments that mean he is presently unable to teach on Wednesdays. Unfortunately this means that we are not able to continue to offer the free half hour of training we introduced in 2009. The timings are as follows. These times are operating from 16th November 2011. 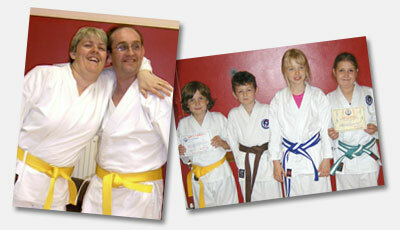 We look forward to seeing you next week, and the change to opening times will be reviewed once Sensei Carl returns. Congratulations to Emily, a regular at Reading Karate Club, who faced stiff competition and won a bronze medal at the 2011 European Wado Cup held in Meißen, Germany. Emily represented England Wado Kai at the European Competition and her result was in the Individual Female Junior Kata category. Congratulations also to Jack Franklin who also represented England Wado Kai and received a bronze in the Individual Male Junior Kata category. Considering EWKR only had a squad of two competitors representing England, this is a fantastic result. Congratulations to Yathavan and Benjamin on their recent grading success at the England Wado Kai Karate Junior Training Course. 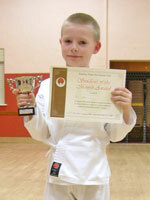 In particular Yathavan was promoted two grades following a successful performance of Pinan Nidan. A double promotion is a rarity and testiment to his hard work and dedication. The course took place at the Edgbarrow Sports Centre in Crowthorne early in October. 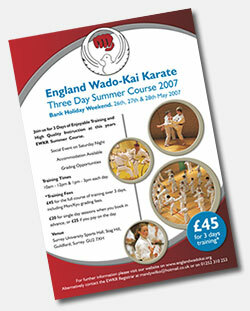 For upcoming EWKR Events please check your newsletter or the courses section on the England Wado Kai Website. This month's Reading Karate Club Student of the Month Award was presented to Danielle following the continuous hard work and effort she has put into her karate training, her consistently positive attitude and her extremely high attendance record. 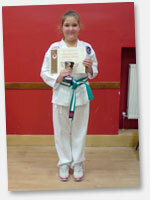 The instructors have been very pleased with Danielle's progress and overall attitude to training. The Student of the Month Award is presented by our instructors each month to the Reading Karate Club Student who displays an extremely enthusiastic, positive and hardworking attitude to training throughout the month. Training and Grading opportunity at the Edgbarrow Sports Centre, Grant Road, (off Pinehill Road), Crowthorne, Berkshire, RG45 7JL. first & will continue throughout the afternoon. Please see latest news letter or EWKR website for further details. The Shiramizu Karate Internship has been announced for next year. This has been going now since 2005 and is an ideal opportunity for anyone who fancies living in Japan for a year and training with the JKF Wadokai under Takamasa Arakawa sensei (6th dan). You have to be between 20 and 35, have a university degree and you have to live there for the whole year. 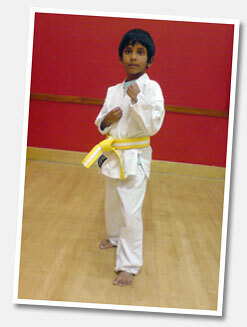 Congratulations to Lokesh who successfully graded to 8th mon (yellow belt) at the EWKR Junior Course held at the Aldershot Dojo on Sunday 27th February. 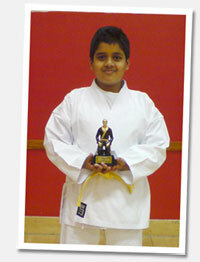 Our extremely prestigious 'Karate Student of the Year Award ' award went to Yathavan who has worked extremely hard over the year, attenting regular training sessions and always putting in maximum effort. 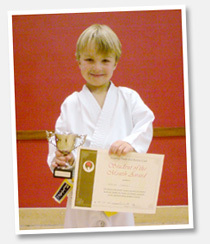 This culminated in his recent success at the EWKK winter course in Crowthorne where he successfuly graded for his Yellow Mon. The Student of the Year Award is presented by our instructors each year to the Karate Student who displays an extremely enthusiastic, positive and hardworking attitude to training throughout the entire year. The Bristol Training Course will take place on Sunday 20th February 2011. It will take place at St. Katherine's School, Sports Hall, Ham Green, Pill, Bristol, BS20 OBU. "With 352 pages and over 1400 color photos, the new Wado-Ryu book Kihon, Kata, Kumite by Roberto Danubio is the most complete and comprehensive reference manual on the techniques of Wado Ryu Karate on the market today." 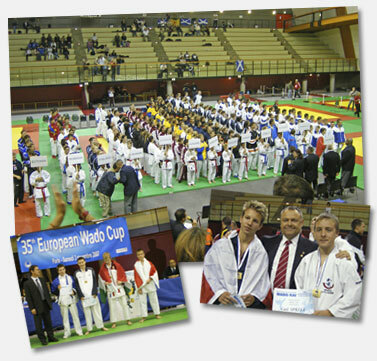 Roberto Danubio, is President and Chief Instructor of the Swiss Wadokai Karatedo Renmei (SWKR). 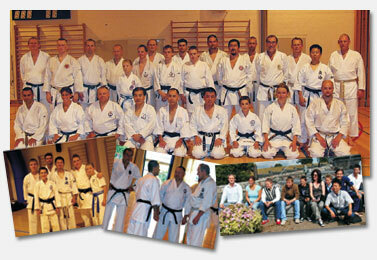 Roberto is recognized as one of the leading technical experts in Wado Ryu Karate in Europe. On a very cold day with Frost & Snow and sub zero temperatures it was an early start for the EWKR trio of Emily Aldridge, Carl spiller & Nico Marengo took a trip of 140 miles down the M4 and M5 Motorway's to Somerset to the picturesque seaside town of Weston Super Mare. No heating in the Main sports Hall meant bare feet were blue but the heat of many people put the temperature up over a period of time, a large entry of 550 Karateka to the Tournament meant a lot of waiting around and Kumite & Kata for the Juniors was first then on to Kumite & Kata for the Seniors all of the EWKR trio did well in both Kata & Kumite Individuals but did not make the podium. Tthen on to Team Kata and in the Final a very sharp and co-ordinated EWKR Kata Team beat Bath University Team and took "GOLD" and their photo is with Trophies pictured in the attachment with Sensei Alan Flook 7th dan Chief Instructor of The Western Karate Union (WKU). A very good day organised well by Kevin Barrett & the WKU Team with Ivor Thomas the Chief Referee doing a good job keeping the area's going under very trying conditions with the cold. Held on Sunday 17th October 2010 at the Connaught Leisure Centre Aldershot, Hampshire, England. This month's Student of the Month Award was presented to Andy following the hard work he put into preparing for his recent grading success, including training for all three days of the 2010 England Wado-Kai Karate Summer Course. The Student of the Month Award is presented by our karate instructors each month to the Karate Student who displays an extremely enthusiastic, positive and hardworking attitude to training throughout the month. 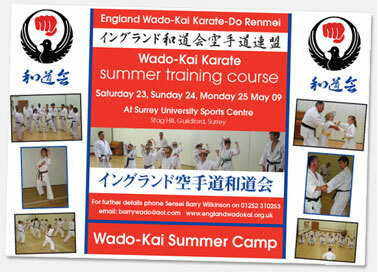 It was a very successful bank holiday for the Reading club, with gradings for Billy, Andy, Carl and Emily at the 2010 England Wado-Kai Karate Summer Course, the biggest event of the England Wado-Kai Calendar. 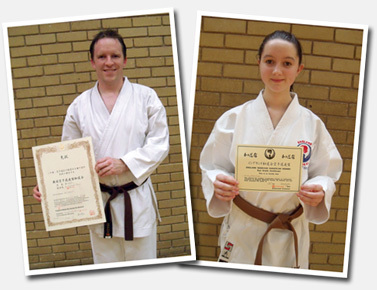 Carl and Emily have been awarded the prestigious black belt grades of Nidan and Shodan respectively after impressing the panel of EWKR senior black belts. The assessments took place after a gruelling 12 hour training course held over three days in Guildford. The black belt gradings involved a written exam and a demonstration of a wide range of karate techniques in front of a public audience and a panel of senior black belts from the England Wado-Kai Association. The techniques included basic techniques (punching, kicking and blocking), combination techniques, pair work to demonstrate various attacks and blocks, several Kata and free fighting. 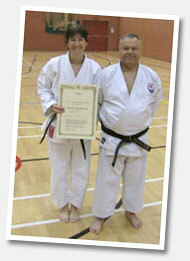 The black belt and certification were presented by 7th Dan Sensei Barry Wilkinson, Chief Instructor for England Wado-Kai. Big congratulations also goto Andy and Billy who successfully graded to 8th kyu (yellow belt) and 6th kyu (green belt) at the EWKR Summer Course after putting in a lot of hard work, both at club training and the course. This month's Student of the Month Award was presented to Spencer. 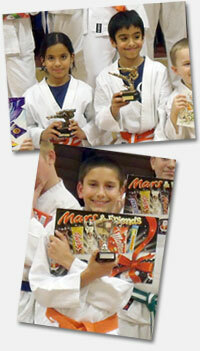 The Student of the Month Award is presented by our instructors each month. It is awarded to the Karate Student who displays an extremely enthusiastic, positive and hardworking attitude to training throughout the month. A new Wado Ryu Karate Book has been released by Roberto Danubio, 6th Dan Wadokai. 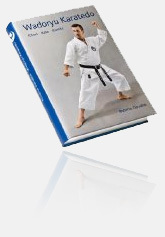 In this Wado Ryu Karate manual you will find a unique and comprehensive collection of all the techniques, Katas and partner exercises of Wado Ryu Karate, in accordance with Japan Karatedo Federation of Wadokai guidelines in a remarkably detailed accuracy never before seen in a reference work. This Wado Ryu Karate book can serve as a teacher’s manual for experienced Karate teachers, as well as an illustrated guide for ambitious students preparing for belt tests. With 352 pages and over 1400 color photos, this book is the most complete and comprehensive reference manual on the techniques of Wado Ryu Karate available. Congratulations to Ben, Bradley and Aaron on passing their recent gradings at the England Wado Kai junior training and grading Course held at the Aldershot dojo on Sunday 28th February 2010. Extra congratulations go to Bradley for earning this month's Student of the Month Award . The Student of the Month Award is presented by our instructors each month to the Karate Student who displays an extremely enthusiastic, positive and hardworking attitude to training throughout the month. All the instructors were pleased with how Bradley performed at the recent Junior Training Course and his success with his grading. approximate 100 plus we were not going to have a late finish the proceedings carried through to Lunchtime where a break was called to feed the Officials with Irish Stew & Chicken Curry as well as other nice buffet culinary delights. The afternoon was very electrifying with a very good standard of Kumite EWKR Members put up a very good but were pushed in to 5th or 6th, those worthy of mention in Kumite - Nico Marengo, Dan Radford, James Reed acquitted themselves with honour it was just not their day, places in the Kata proved more successful especially with two Brothers Shaun & James Reed battling for in that coveted final for the Gold Spot for their Podium moment, in Kata saw EWKR taking eight places in the medal stakes with two (2) Gold one Silver and 5 Bronze Trophy/Medal spots. Well done to all of the 16 EWKR Squad especially to the EWKR Eight who were successful in Belfast through their own hard work determination and tenacity reachingthe meal spots they did us proud. 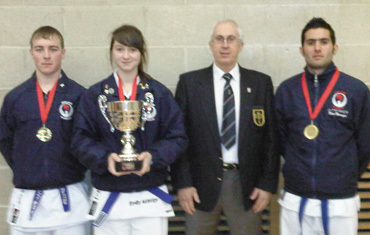 The next Tournament is the Ireland International Tournament Saturday 24th April 2010 in Ardee County Louth, Ireland. 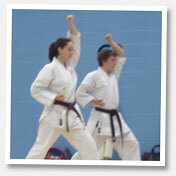 Unfortunately there will be no karate on Wednesday the 1st and 8th September. 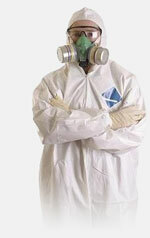 This is because the building will be closed for two weeks to remove asbestos from the loft area in the cellar. Normal training should resume on Wednesday 15th September; please watch the website for the latest updates. Regretably there will be no club training on Wednesday 7th April due to major road works on Northumberland Avenue. However we will still be having our Easter Egg training session on Wednesday 31st March. 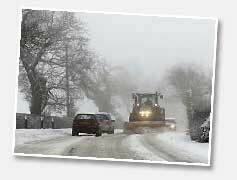 With regret, due to the continuing weather and road conditions there will be no karate this week. We plan to resume training next week on the 20th Jan.
We also plan to run our Christmas competition, with medals for everyone, the following week on the 27th Jan.
We have received word that there will be no training this Saturday (9th Jan) at the Crowthorne club due to the weather conditions. For further details please contact Sensei Wilkinson directly, you can find his phone number in the back of your registration books. 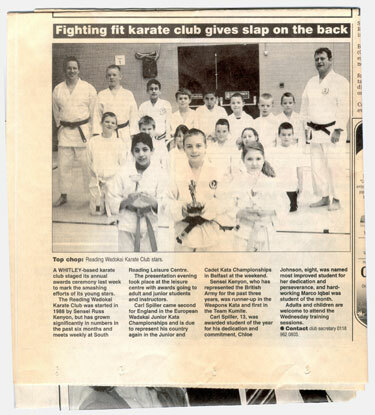 15 Jan 10 - Reading Karate Club Returns! 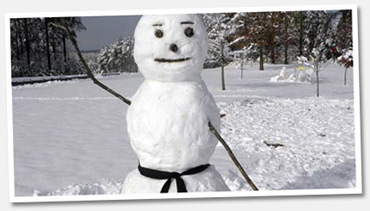 Now the snow has started to thaw and life is getting back to normal; training at Reading Karate Club will start on Wednesday 20th Jan.
We will run our postponed Christmas competition, with medals for everyone, the following week on the 27th Jan.
Due to the current extreme weather conditions there will be no karate this week. We plan to resume training next week. Happy New Year and we look forward to training soon . . . 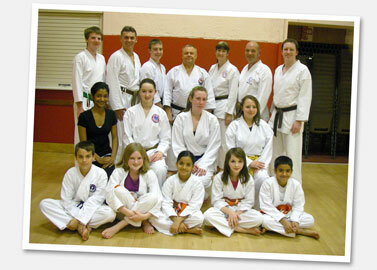 There will be no training at the Reading karate club on Wednesday 17th Feb 2010. This is because we are closed during the half term. If there is sufficient interest we will open on the other half terms during the year. To ensure we can meet our hall fees and the club instructor insurance this year, we will be raising the training fees by 50p, from £3.50 to £4.00 for under 16s and £4.50 to £5.00 for adults. We regret having to make a price increase and it is something we’ve avoided for as long as possible. However it is necessary at this stage and we feel we are still very competitive when compared to other Karate and Sports clubs. 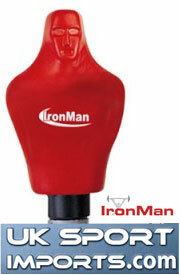 The price change will take effect from the fist week in february (3rd Feb 2010). The price increase will be reviewed later in the year and if we have a consistent increase in numbers we will reduce the prices again. Any profits made at the club are always used to benefit our students and all the team that run the club are all volunteers. The additional free half hour we introduced last year has been a great success and we will continue with this, running our class from 18:30 - 20:00. 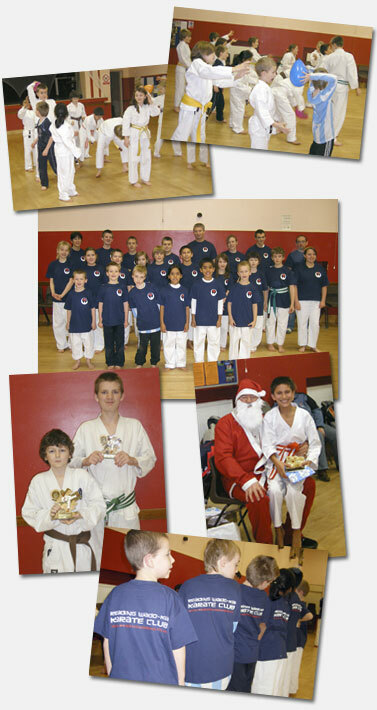 Thanks for all your support over 2009 and we're looking forward to a great year of karate in 2010. During the holidays a Fire broke out in the Boiler Room of the Edgbarrow Sports Centre in Crowthorne. The building is currently out of use and Sensei Wilkinson is waiting to hear when the building will be functional again. This has NOT affected training. On Saturday 9th January club training WILL take place at the Methodist Church Hall, 10 Dukes Ride which is opposite the Prince Pub just off of the High Street of Crowthorne. 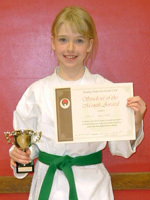 Congratulations to Emily who successfully passed her 1st Kyu grading at the England Wado-Kai Winter Course held at Farnham Sports Centre on Sunday 6th December 2009.. This month's Student of the Month Award was presented to Ben. 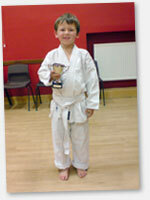 All the instructors are really pleased with how Ben's karate has developed over the last month. 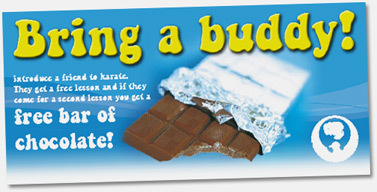 Bring a friend along to karate. They get a free lesson and if they come for a second lesson you get a free bar of choclate. 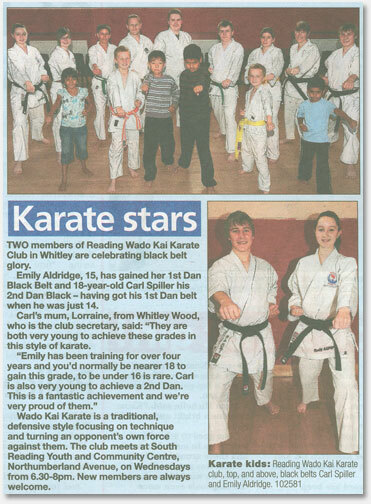 Carl & Emily from the Reading Club were part of the England Wado Kai Karate Squad that competed at the European Championships in Edinburgh. 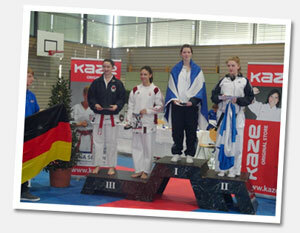 England Wado Kai won 10 Medals in total, more than doubling our previous years tally of 4 bronze medals in Luxembourg. 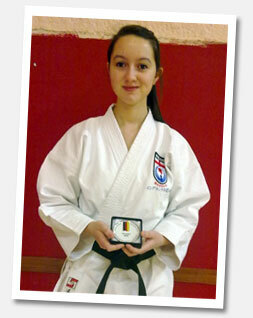 Congratulations to Emily for her silver medal. All in EWKR enjoyed the Caledonian Hospitality as the organisation skills of the Scottish Karate Federation did us proud. The assessment took place during a 9 hour training course held over 2 days at the Woodroffe School, Lyme Regis. The black belt grading itself involved a written exam and a demonstration of a wide range of karate techniques in front of a public audience and a panel of senior black belts from the England Wado-Kai Association. The black belt and certification were presented to Rebecca by 7th Dan Sensei Barry Wilkinson, Chief Instructor for England Wado-Kai. 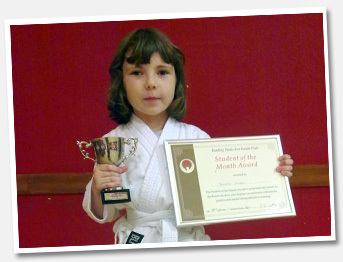 This month's Student of the Month Award was presented to Nikita. 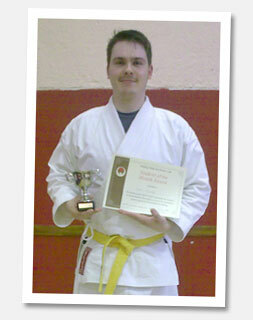 Rob Barrett, a karate student and assistant instructor from Reading Wado-Kai karate club, has been awarded the prestigious black belt grade of Shodan, following an assessment at the 2009 England Wado-Kai Karate Summer Course, the biggest event of the England Wado-Kai Calendar. The assessment took place after a gruelling 12 hour training course held over 3 days at the Surrey University Sports Centre, Guildford. The black belt grading itself involved a written exam and a demonstration of a wide range of karate techniques in front of a public audience and a panel of senior black belts from the England Wado-Kai Association. The black belt and certification were presented to Rob by 7th Dan Sensei Barry Wilkinson, Chief Instructor for England Wado-Kai. 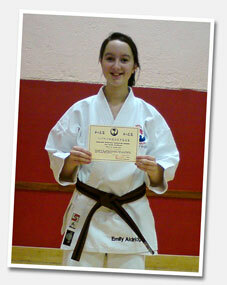 Congratulations also goto Emily who successfully graded to 2nd kyu (brown belt) at the EWKR Summer Course. 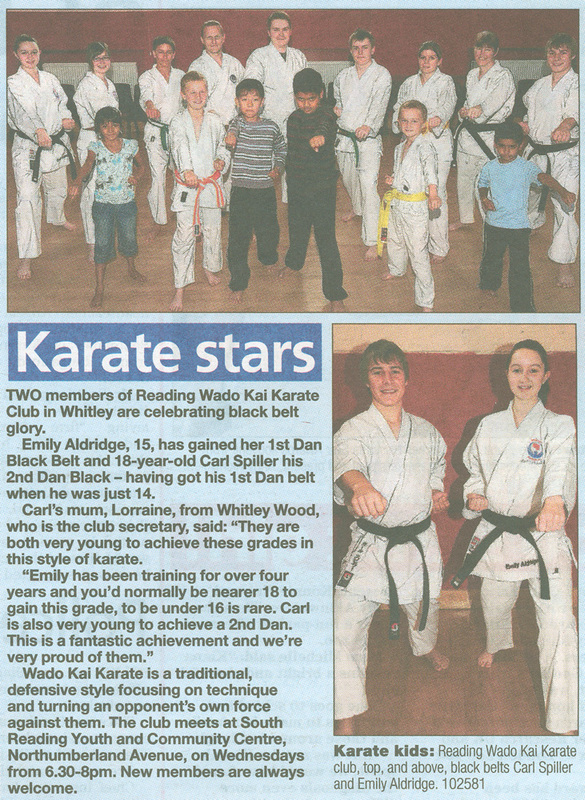 Sensei Barry Wilkinson visited Reading Wado Kai Karate club recently to take the lesson and offer some training to our students. We had a very good turn out and everyone seemed to enjoy themselves and learn something new. Thanks to Sensei Wilkinson and all the students who made an effort to attend. 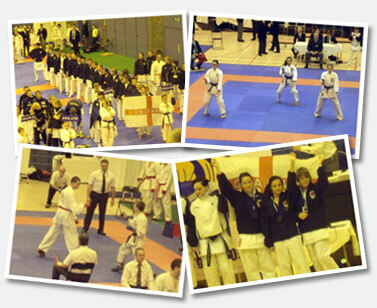 Congratulations to everyone who took part in the England Wado Kai Tournament, held in Aldershot on Sunday 29th March. 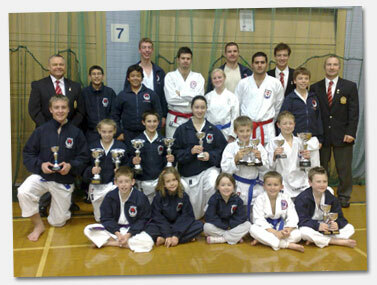 Congratulations and a very well done to all of our successfull England Wado-Kai Squad. Training will be back to normal the following week (23/09/09). 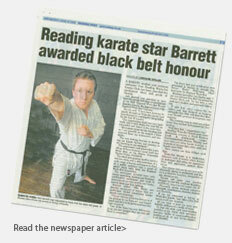 Sensei Barry Wilkinson will be visiting Reading Wado Kai Karate club to offer some training on Wednesday 8th April 2009. This is a rare opportunity for club members to train with Sensei Wilkinson at our dojo, so please make the effort to attend. Congratulations to Billy, Bradley, Aaron, Sam and Alex on passing their recent gradings at the England Wado Kai junior training and grading Course held at the Aldershot dojo on Sunday 22nd February 2009. 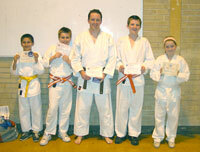 There are 3 days training and grading opportunities over the weekend of 23-25 May 2009. For further details see your newsletter. On the last karate lesson of the year we took some time out from the sylabus and had some fun and games. 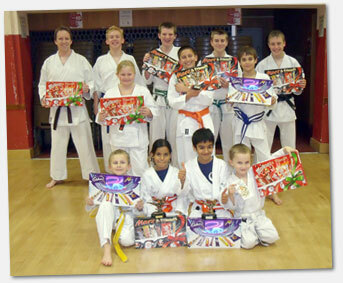 At the end of the lesson the students were given some Christmas presents and the end of year presentations were made. Our extremely prestigious 'Student of the Year' award went jointly to Sahil and Annika who have both worked extremely hard over the year, attenting regular training sessions and courses. 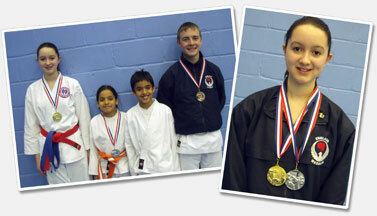 This culminated in their recent success at the EWKK Winter course grading. Congratulations also to Billy who won the Student of the Month award for all his hard work and dedication over the last month. Success for England Wadokai at the Wado Ryu Federation Karate Tournament on Sunday 16th November held at Yate Leisure Centre, Kennedy way, Yate, Bristol. We came away with 18 Trophies. The EWKR fielded a mixed ability squad for this event, including some for the first timers, such as Grace Curry, Izzy Cashmore & Ellie Mathews. Well done to all who competed, including those who achieved a great deal but were just pipped in to fourth place. It will I am sure be, with such determination, a next time success. Congratulations to Oli, Sahil and Annika on passing his recent gradings at the England Wado Kai Winter Course held at Farnham Sports Centre on Sunday 7th December 2008. Sahil and Annika earned their Orange Mon (7th Mon). 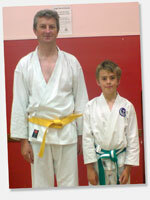 Oli earned his Green Belt (6th kyu). We are very happy to report that the association won four medals for England in The Europeans in Luxembourg last weekend (Saturday 25th October), doubling what we won last year and in Paris and the year before in Budapest. 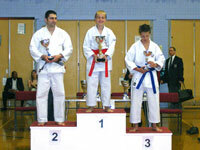 Daniel Peach (Glossop Club near Manchester), Bronze in Kumite. There were 17 Countries represented with 16 Countries taking an active part Ireland being the only Country not to send any Competitors. On Monday 4th August 2008 six members of England Wado-Kai (Scott Rawlings age 10 alias The Noodle, Jack Franklin aged 13, Carl Spiller age 16, Steven Wood age 17 alias Andy Pipkin Dan Radford age 19 and Barry Wilkinson) and two Mums (Julie Franklin and Anne Rawlings) got up at crack of sparrow to travel to Gatwick Airport to fly to Copenhagen to participate in the JKF Wado-Kai Denmark Tour. This was held at The Tokai University Japanese Boarding School in Prastoe 80 kilometers south of Copenhagen. The gang were picked up on Monday by mini buses by Sensei Haru Hirota 5th Dan Wado-Kai who was a Maths teacher at the School in Denmark for 8 years and Mr Taguma an adminstrator of the Tokai School. The first session from 18.30 until 20.30 and was very in-depth Wado-Kai Training under the JKF Wado-Kai National Coach Sensei Toshiaki Maeda 7th Dan assisted keenly by Sensei Sano assistant National Coach and translated by Sensei Haru Hirota. After training we had an international Dinner of Pasta and Salad washed down with Danish Beer many "Campai's" cheers with an old friend of England Wado-Kai Tamara Schuu 2nd Dan from Luxemburg also the World Famous Sensei Shingo Ohgami 7th Dan accompanied by Sensei Thomas Tossbrant 5th dan and Dan Grades Daniel & Christian from the very Famous Samurai Dojo of Gothenburg, Sweden. This month's Student of the Month Award was presented to Jack. It is awarded to the Kids Club Karate Student who displays an extremely enthusiastic, positive and hardworking attitude to training throughout the month. Congratulations to Jack on passing his recent grading at the England Wado Kai Summer Course held at the University of Surrey..
Jack earned his Orange Belt (7th kyu). 13 Apr 08 - Reading Club wins Gold! Congratulations to Carl Spiller and Stewart Ratcliffe for winning gold for kata on 13th April 2008 at the UK Open Karate Tournament in Bristol. To celebrate their success Lorraine arranged for this wonderful cake and got their picture in the papers. On the last karate lesson of the year Santa took some time out from his very busy schedule to visit the Reading Wado-Kai Karate Club. He dropped off some early Christmas presents of exclusive club tee-shirts to all the students. After watching some of the fun and games Santa then presented our prestigious 'Student of the Year' and 'Most Improved Student' awards; this year going to Jake and Olli. This month's Student of the Month Award was presented to Ollie. Congratulations to our students who worked very hard and passed their recent gradings at the SKW Winter Training and Grading course in Farnham. 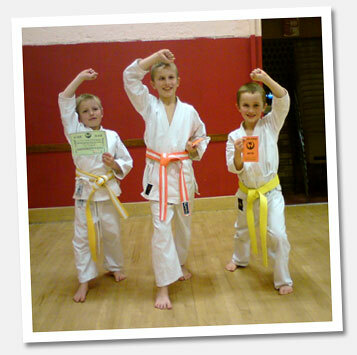 Levis earned his Yellow Stripe (8th mon), Alex her Yellow Belt (8th Kyu) and Oli and Sam both earned their Green Stripes (6th mon). 21 Nov 07 - European Success! 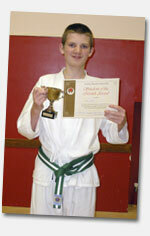 European success for 15 year old Reading Wadokai karate club member Carl Spiller. 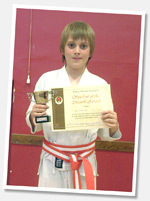 Carl was selected to represent England along with 3 other children in Paris for the 35th Federation of Wadokai European Karate Championships on 2nd November 2007 held at the Institute de Judo, Port de Orleans, Paris. During a competition that saw 13 nations competing against each other he was awarded for his hard work and dedication by winning a coveted bronze medal in kumite. 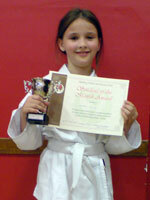 This month's Student of the Month Award was presented to Chloe. 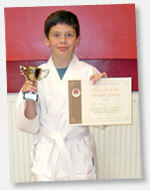 Congratulations to Jack on passing his recent grading. 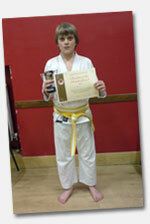 Jack earned his Yellow Stripe (8th mon). This month's Student of the Month Award was presented to Levis. On Wednesday 08 August Chief Instructor Sensei Barry Wilkinson returned to the Reading Wado Kai Club to take the lessons and carry out some gradings. Sensei wilkinson taught both the Adult and Children's classes and everyone seemed to enjoy themselves and learn something new. Congratulations to Hayley and Amber who both graded. Hayley earned her Blue Belt (5th Kyu) and Amber earned her Yellow Belt (8th Kyu). 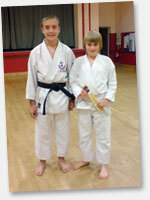 Congratulations to Sam and Graham who both graded at Aldershot this month. 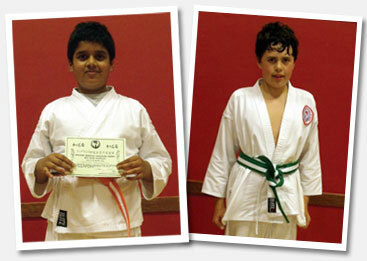 Sam earned his Green Stripe (6th mon) and Graham his Yellow Belt (8th Kyu). This month's Student of the Month Award was presented to Hayden. 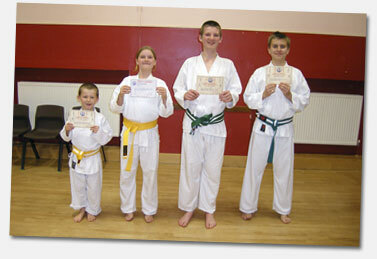 Congratulations to Jamie and Chelsea who both graded this month. 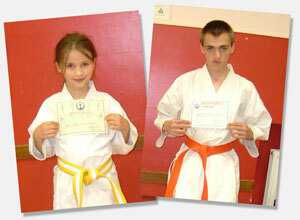 Jamie earned his Orange Belt (7th Kyu) and Chelsea earned her Yellow Stripe (8th Mon). This month's Student of the Month Award was presented to Chelsea. We have had lots of students successfully grade this month; early in the Month Dave and Lorraine earned their Yellow Kyu belts after being graded by Sensei Terry Armsworth at his club in Basingstoke. Later in the month Reading Wado Kai Karate Club was well represented at this years SKW Summer Course held in Guilford over the bank holiday. we had 4 club members who successfully graded which is a fantastic result and testiment to all their hard work and training. Well done! This month's Student of the Month Award was presented to Jasmine. Carl represented Wado England and made it through five rounds of tough competition to reach the final of the Open Wado Kata Competition in Bristol. To win the gold unanimously Carl did Seishan Kata and went home with the biggest trophy in the world! This month's Student of the Month Award was presented to Sam. Reading Wado Kai Karate Club was extremely well represented at this years SKW Spring Course at the Robert May School, Odiham, Hampshire. This month's Student of the Month Award was presented to Orin. Well done to Jamie and Ashley who earned their Yellow belts (8th kyu) at the SKW Junior Training and Grading course at the Connaught Leisure Centre in Aldershot. 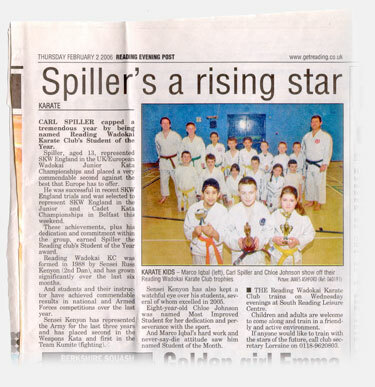 On the 3rd February 2007 Carl Spiller entered the Belfast, North v South, open karate tournament at the Devenish Complex in Belfast. 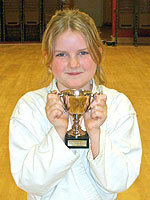 In the kumite tournament Carl progressed through two rounds before losing in the 3rd. 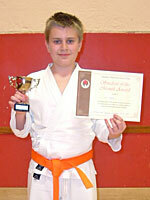 In the Kata competition Carl did extremely well, winning a bronze medal. 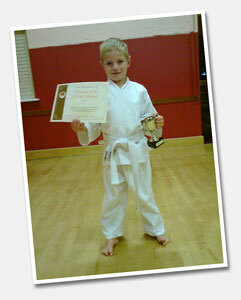 This month's Student of the Month Award was presented to Alex. The Student of the Month Award is presented to the Kids Club Student who has worked the hardest and has progressed well over the month. On the last day of the year Santa took some time out from his very busy schedule to visit the Reading Wado-Kai Karate Club. He dropped off some early Christmas presents of gum shields and chocolate to all the students in our Kids Club. After watching some of the fun and games Santa then presented our prestigious 'Student of the Year', 'Student of the Month', and 'Most Improved Student' Awards. 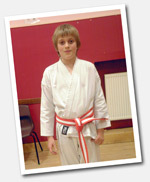 In July 2006 Carl was selected along with 3 other boys for the unique opportunity to go to school and train in Japan for 2 weeks by Sensei Barry Wilkinson. Carl traveled to Japan in September 2006 and he returned with a wealth of knowledge, a keener eye and much sharper techniques. Carl enjoyed living the Japanese life and the experience so much that he is now busy saving to repeat the trip in the summer of 2008 with his friend Stephen, who went with him previously. He has already contacted the family he stayed with and they have said that he is more than welcome to stay with them again. 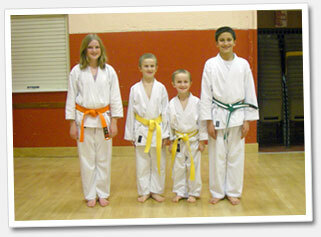 At Reading Wado Kai Karate club we run a class catered especially for children.